Compact elegance for coffee connoisseurs. The ultra-compact JURA A1 delivers rich, full-flavored espresso without taking up valuable counter space. Perfect for coffee purists, this one-cup machine uses an innovative Pulse Extraction Process (P.E.P. ), which achieves the exceptional quality of a professional barista. The built-in AromaG3 grinder delivers ground beans in half the time without impairing flavor. 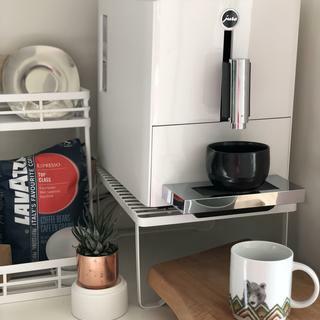 Plus, the user-friendly control panel makes it easy to customize your preferred size and strength and lets you brew café-style espresso, ristretto or coffee with just one touch. Click here for the JURA Workplace Brochure. Click here for the JURA Maintenance Brochure. Capacity: Water tank: 37 oz. ; bean hopper: 4.4 oz. Love it. It is my second one same model. THe first one stopped working after about 4 years but I loved it tenough that I bought the current model again. It is not worth paying $600 more for the milk frothing options. Just buy a separate milk frother. The espresso and larger coffee size options are both fabulous. Much preferred over drip coffee. This machine is perfect for espresso and coffee. So easy to use and very low maintenance. We found the unit to be difficult to maintain and overly sensitive to drip tray and used grounds levels, requiring daily maintenance with limited coffee making. The Jura makes such excellent coffee that I no longer need to go to the coffee shop on my way to work! The taste compared to a Cuisinart Drip coffee maker is amazing! The coffee's taste is highlighted. I would buy this machine again! When we first tried Jura coffee at a friend's home, we were amazed at how much better it tasted than any of the K-cup coffee we had been drinking. I always bought premium K-cup brands of coffee, but they all were lacking in flavor, and it may have been my imagination, but there were overtones of plastic in all of them. So we bought this Jura A1, and every cup since has been an absolute delight. Love using it with Starbucks Cafe Verona. Expensive, but worth it. Highly recommended and very easy to use. And no more wasted plastic cup packaging. Feels like France in our home every morning! We love our jura! The coffee selection makes a perfect “americano”, and we feel like we are in France every morning. Also love the way it self cleans before and after each cycle. This machine was well worth the price!! Really enjoying the coffee. Only negative is you get awfully spoiled drinking good coffee. I am the only coffee drinker in my family thus have been a long suffering pour-over coffee maker for my one cup of coffee in the morning and one cup in the afternoon. measure the grounds, saturate the grounds wait one minute, pour three ounces wait for that to drip through, pour another three ounces.... torture. now it's just one button and bam. happiness. coffee that's better than my 8 minute pour over. a wonderful indulgence. aesthetically pleasing, small footprint, easy to refill, fun to use. Picked one up a week ago, and it fits my needs perfectly: espresso/ristretto and nothing more. No milk, no foam, no nuthin'. I roast all my beans and coupled with this machine, it's a pleasure each morning, no muss, no fuss. We do like our new coffee maker. We gave our 10 year old larger S9 Jura to a friend. We wanted the smaller one after we remodeled the breakfast room counter and realized that we no longer do cappuccinos and the like. The only negative is the fact that this machine needs to have the grounds emptied very often. Sometimes the light comes on after only two cups. There is hardly any grounds in the container. Not sure why it is indicating "empty grounds." The other thing that my husband doesn't like, is the small water container. We can get use to that. Some of the parts do not seem to be as sturdy as those of our previous machine. Still, we do like it. Makes great coffee and super easy to use. It is much lower maintenance than the ones handle milk. When there are more people drinking coffee, we do need to add water and clean the waste bin more frequently but they are not that much work. We still need to clean after 88 cups but again it is a very easy process. BTW, we use sightglass coffee bean, highly recommended. My only criticism of this machine is that due to its small size it needs water frequently. But the advantage to a small coffee machine is that it doesn't take up a lot of room on the counter. This makes good coffee. 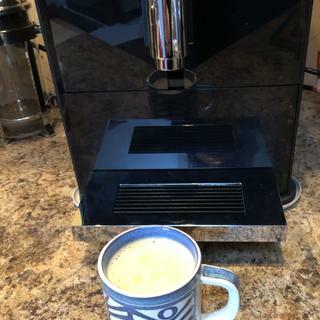 After having a couple of fully automatic machines by Delonghi, we decided to handle the milk portion of our coffee with a dedicated milk frother and purchase a more simple coffee machine. We chose this one and are very happy so far, a few months in..
Great Machine and Wonderful Coffee! I love the fresh ground beans in the morning and the fact that it’ll make one cup at a time. Very easy to use. We owned a Jura Ena Micro1 and loved it, until it broke after three years; and since we don't use the milk features, we are ordering another Jura without the milk features. I highly recommend Jura for anyone that loves coffee. Great simple model that grinds beans and makes high quality, fresh individual cups, without the hassle of milk and excessive cleaning. We prefer to add our own milk/creamer separately, so this is perfect for us. Wedding gift on the couple's registry. It is sleek and white. I had a cup of coffee made from it at a Sur La Table class in Madison, Wisconsin. I read reviews that asserted this machine makes superb coffee. I like that it cleans itself twice with every operation. I like the design and look. Had a bigger Jura before and loved it! Our guide said for simple coffee and expresso this was the one!!!! It is the updated version of the Jura ENA Micro 1. I have used Jura machines for many years, and they make perfect espresso drinks. I had a larger Jura model and it lasted for 15 years. It just stopped working. I wouldn't look at any other brand. Great coffee and so easy to use. my daughter owns this Jura coffee maker best taste, love it! Single cup on demand. Quick. High quality coffee. The lady did a demo of this machine at the Naperville store yesterday and we liked it! We ordered online because of the free shipping. How many ounces of coffee does the “coffee” setting make? Not enough. It fills about 1/2 of a regular coffee mug. Can we use any type of bean? BEST ANSWER: Best to use normal beans without flavors added. The flavored ones have added chemicals that can ruin the mechanics of all fully automatic coffee machines. You should not use the more oily beans as it will eventually clog your machine. What is the largest cup size (in ounces) that it will brew for coffee? My travel mug is 12 oz so I'd like to brew that amount. whats the difference between this and the micro 90? BEST ANSWER: With the Jura micro 90 you can add an attachment so you can also make lattes, cappuccinos, etc. The Jura A1 will grind the coffee and make black coffee in espresso, ristretto, and coffee sizes. Can you adjust coffee temp? BEST ANSWER: I have had the machine for about 8 months and haven’t figured out how to do it. I’m pretty certain you can’t adjist temp. No you can adjust the strength in 2 steps and the fineness of the grind. I don't think so, but the factory setting is hot enough for us. Yes you can, there is a setting for "normal", and "high". Not that I am aware of.... Love the Jura!! Does it have a special receptacle for ground coffee? BEST ANSWER: Yes. there's a grounds container right behind where you place your cup. who is the manufacturer and country it was made? BEST ANSWER: This is made by Jura in Portugal. Do you ever have to clean out the coffee grounds or is it automatic? BEST ANSWER: There is a tray that needs to be removed with a container that collects the grounds that needs to be emptied out. A light will prompt you when to do it. If both my husband and I are slugging coffee like crazy, we need to do it daily. If just one of us is around, it needs to be done about every other day or so. It's easy and takes less than a minute or two to do. The grounds are automatically dumped into a container inside the machine, which needs to be dumped out after about 8 cups of coffee. Aside from that, the machine has a self cleaning cycle that needs to be run about once every month or two, and requires a cleaning tablet. So far, the machine has been amazing. Love it. Yes. You need to clean and decalcify the machine. The machine tells you when to run the cleaning and decalcification routines. Two different symbols on the machine will indicate when to perform maintenance. Two different routines, two different tablets. It is all detailed in your manual. Automatic. The device processes grounds into an easily removed compartment that pulls out from the front. The machine tells you when you need to empty that compartment out. I grind on the “more beans” setting and empty it once every 6-8 coffees or so. Yes, we have to empty the grounds container and empty the rinse tray. We usually do that when we refill the water container. Just pull out the tray and grounds container and empty it and then empty the water from the tray. Very simple. You need to clean out the grounds and excess water every 3-5 cups and use cleaning tables every couple of months to keep it clean. So yes, there has to be some place for them to go. Yes. You will need to clean out the coffee grounds often - probably every dozen or so coffees. The machine lets you know when it needs to be cleaned out. And it is quick and easy. There is a bin inside the machine that collects the grounds, and it has a light to tell you when the bin needs emptying. The bin can hold grounds from several cups of coffee. The machine automatically dumps the used ground in a neat little compacted tab to a bin that is easy to empty. The machine tells you when it needs emptying as well. After each brew cycle, the grounds are deposited in a removable cup inside the machine. A warning light indicates when to empty the cup. You have to clean the coffee grounds. That means you can make between 4 and 6 cups before having to remove those grounds. Grounds are compressed and drop into a receptacle inside the machine. When full it displays a message to empty the bin. There is a small plastic removable bin where the machine dumps the used grounds. Easy to remove, clean and put back. I have never cleaned the coffee grounds in 18 months from inside the machine and have not experienced any issues. When he machine alerts you the grinds container is full and you have to empty it. It’s east. Every ~8 or 9 uses. The grounds go into a receptacle that has an indicator that lights up when full. Very easy to empty and clean. Yes, you have to clean it out. They get deposited in a little tray that needs to be emptied. Of course you have to clean out the grounds. Where would they go? Does it come with a water filer? BEST ANSWER: You typed "filer", I'm going to assume you meant filter. There is a water filter in the machine, you will need to replace every two to three months depending upon how much coffee you make. The filters are available on Amazon, are not cheap, but a small price to pay for the privilege of drinking such good coffee. Replacing them is very easy. I believe it included 1 water filter. It is optional to use a water filter, but I highly recommend doing so. I have not had any buildup in my water tank while using the filter. My old Keurig constantly had residue/buildup in the tank that was difficult to remove. Yes. It does come with a filter but we have reverse osmosis water so do not use it. We do like this coffee machine. I seem to recall mine came with one water filter and a cleaning tablet or three. If you are asking if the machine comes with a water FILTER, the answer is yes. Yes, one. You will need to buy replacement ones separately though. The Jura comes with a water filter. An excellent machine! Yes. It’s part of the packaging. It has a water filter cartridge. Yes, I believe it does. BEST ANSWER: It does "espresso" hot very well, but it doesn't do "percolator" hot. Espresso is made and drunk at a slightly lower temperature; they're NOT burning hot. This machine makes perfectly "degree'd" espresso. It's hot, but not boiling (as it should be done at 180 degrees). No pure espresso machine is good for adding cold milk/cream/sugar to without it being "less than boiling." Hope that helps. We think the coffee is hot. I guess it depends on your preference. I think temperature can be subjective. I like that I can drink it without having to let it rest before drinking. We are in our third Jura machine and never thought of looking at another brand. How often do you need to change the water filter? Depends on how many cups and the size of the cup you choose :) When we have four people who drinks 1-2 cups a day, perhaps once a day with largest cup size. Approximately once every 3 months. How can I add a little more hot water to my espresso without adjusting the present settings? BEST ANSWER: I'd use the right button for the larger coffee and just stop the coffee/water flow when you have enough. That larger coffee is basically just an espresso with more water to thin it out into a coffee. in the beginning the coffee/espresso flows and then it's filled up with water. I have not tried that yet, but there are instructions in the manual for: Permanently setting the amount of water for the cup size'. It is page 13 in my manual. I hope that helps. You cannot, without changing the settings. What are the vents for on the side of the unit? BEST ANSWER: Those are not vents. I thought (the same as you) that they were vents. They appear to be aesthetic design features. After a month or two, I'm happy to have purchased it. The machine works very well! Can this be plumbed to a water line? BEST ANSWER: No, it can't.